Sea Sparkle: Pretty, or pretty bad? 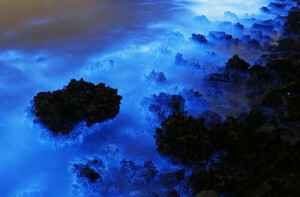 You probably aren’t too familiar with Noctiluca Scintillans, the alluring not-quite-algae responsible for the beautiful displays of light in the oceans surrounding Hong Kong. This unusual single-celled sea life, also known as “sea sparkle” gives off a bioluminescent glow when agitated, either by the movement of the waves or by a passing ship or fish. The breathtaking light shows are visible in many parts of the world, but become more prevalent in areas where increased nitrogen and phosphorous runoff from agriculture upset the delicate balance of the local ocean ecology. 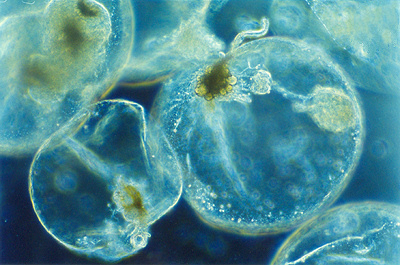 Noctiluca scintillans is an organism that functions both as a plant and an animal. While the organism in itself is not toxic, it tends to feed on phytoplanktons, and because noctiluca scintillans does not move from place to place, the buildup of excretions from its feeding results in high levels of ammonia in the surrounding water. This can lead to problems with surrounding sea life when heavy blooms of noctiluca scintillans take over large aquatic regions. We’re always impressed at the delicate balancing act our oceans perform to keep our entire globe running properly, and also by how easy it is for a few careless people to throw everything off kilter. Just a bit too much pollution from farms can cause seawater to become too nutrient-rich, leading to an overgrowth of noctiluca scintillans. The high ammonia caused by the overgrowth in turn causes problems with local sea life, problems which move gradually up the food chain until finally, they reach your dinner plate. Well, first, do your part. Be a responsible citizen of the globe. Recycle. Find ways to get involved. Educate yourself on the issues. Then get out there and make a difference! It takes a whole lot of drops to fill the ocean, and that ocean is depending on us.